Oscar also known as Astronotus ocellatus is a fish species from the cichlid family. This species is native to South America although it can be found in other areas such as Australia, China and the United States. In the US in particular, Oscar is a famous aquarium fish. The discovery of Astronotus ocellatus is attributed to Louis Agassiz in the year 1831. This fish species can grow to about 45 cm in length and 1.6 kilograms in weight. The wild varieties are darkly colored with some yellow-ring spots on the dorsal and caudal fine. The spots are said to limit fin-nipping by the piranha. The Oscar also has capabilities that enable it to change its color so as to camouflage from predators. Juvenile Oscars can easily be differentiated from adults in that they are striped with orange and white wavy bands and have spots on their heads. Native to Colombia, Peru, French Guiana, Brazil and Ecuador, the Astronotus ocellatus prefers slow-moving water habitats and often shelters under submerged branches. It does not tolerate cooler water temperatures and this is why it is confined to the areas of South America which are relatively warmer with average temperatures above 12.9 degrees Celsius. 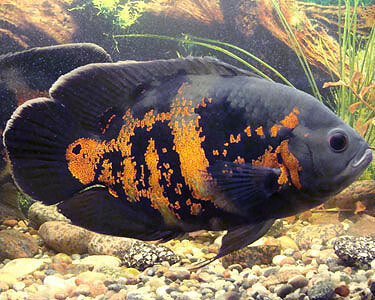 The male Oscars grow rapidly and possess dark blotches on the lower section of their dorsal fins. They reach sexual maturity at about one year of age and their reproductive lifespan extends to between 9 and 10 years. The occurrence of rain determines the timing and frequency of spawning. They prefer flattened vertical or horizontal surfaces to lay their eggs. They are prolific spawners laying about 1, 000 to 3,000 eggs. Oscars are usually fed with carnivorous diets consisting of insects, worms and crayfish. They can also feed on live organisms. This type of fish also feeds on fruits such as oranges and melons. Goldfish should not be fed to the Oscar because they contain an enzyme known as thiaminase which binds Vitamin B1 resulting into a deficiency.